Background and objectives Mutations in the TRPC6 gene have been recently identified as the cause of late-onset autosomal-dominant focal segmental glomerulosclerosis (FSGS). To extend the screening, we analyzed TRPC6 in 33 Italian children with sporadic early-onset SRNS and three Italian families with adult-onset FSGS. Design, setting, participants, & measurements TRPC6 mutation analysis was performed through PCR and sequencing. The effects of the detected amino acid substitutions were analyzed by bioinformatics tools and functional in vitro studies. The expression levels of TRPC6 and nephrin proteins were evaluated by confocal microscopy. Results Three heterozygous missense mutations (c.374A>G_p.N125S, c.653A>T_p.H218L, c.2684G>T_p.R895L) were identified. The first new mutation, p.H218L, was found in a 18-year-old boy who presented a severe form of FSGS at the age of 8 years. The second, p.R895L, a new de novo mutation, was identified in a girl with collapsing glomerulosclerosis at the age of 2 years. The former mutation, p.N125S, was found in two siblings with early-onset steroid-resistant nephrotic syndrome (SRNS) at the ages of 4 and 14 years. 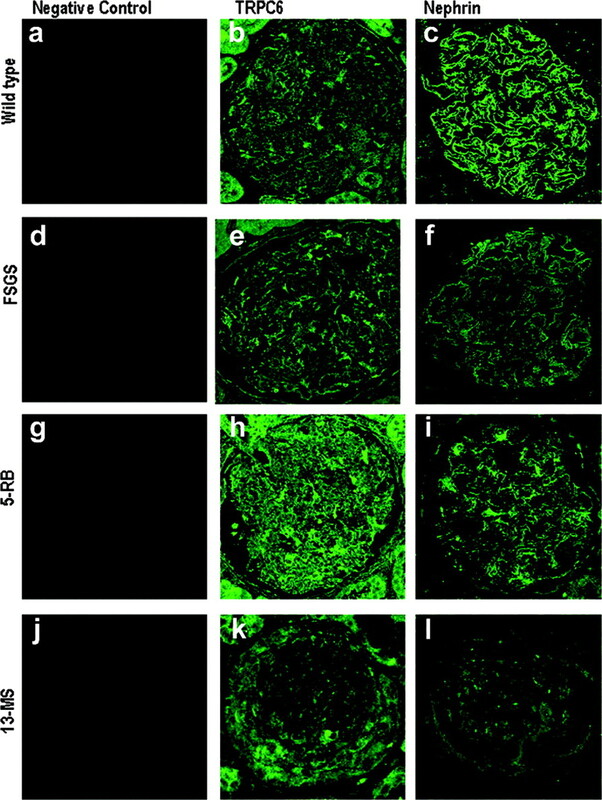 Renal immunofluorescence revealed upregulated expression of TRPC6 and loss of nephrin in glomeruli. 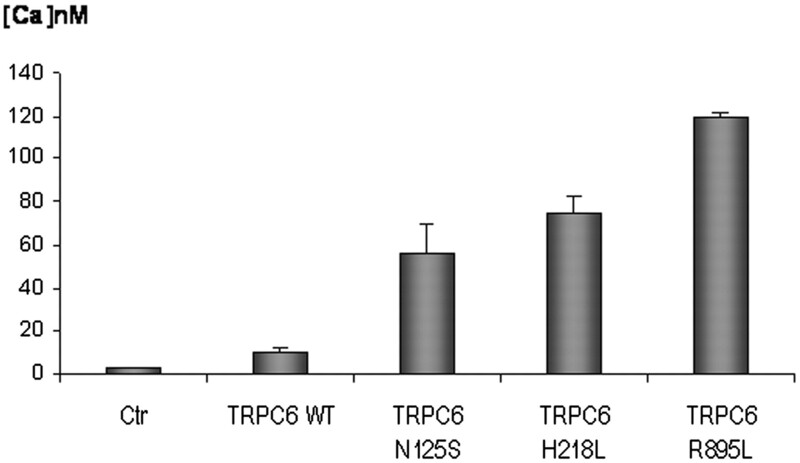 The intracellular calcium concentrations were significantly higher in the cells expressing all mutant TRPC6 channels compared with cells expressing wild-type TRPC6. Conclusions Our findings suggest that TRPC6 variants can also be detected in children with early-onset and sporadic SRNS (4 of 33 patients). Moreover, in one patient a new de novo TRPC6 mutation was associated with a rare severe form of childhood collapsing glomerulosclerosis with rapid progression to uremia. The discovery of genes involved in podocyte development and function was crucial for understanding mechanisms of glomerular kidney diseases that cause various degrees of proteinuria and, potentially, the progression to ESRD (1). The list of genes involved in nephrotic syndrome (NS) is rapidly increasing (NPHS1, NPHS2, WT1, PLCE1, CD2AP, ACTN4, and TRPC6) and includes at least seven molecules associated with variable inheritance (2–9). Heterozygous mutations of TRPC6 have been recently identified as the cause of late-onset autosomal-dominant focal segmental glomerulosclerosis (FSGS) (8–12). The TRPC6 gene is located at the long arm of chromosome 11 (11q22.1) and codes for the transient receptor potential cation channel, subfamily C, member 6. The TRPC subfamily (TRPC1 through TRPC7) is a group of calcium-permeable cation channels that are important for the increase of the intracellular calcium concentration in response to phospholipase C (PLC) activation and are involved in many different signaling cascades of cell growth and mechanosensation (13,14). TRPC6, TRPC3, and TRPC7 are directly activated by diacylglycerol (DAG) responding to PLC-mediated signals (15). In the kidney, TRPC6 is expressed in renal tubules and glomeruli with predominance in podocytes. So far, 11 different mutations in the TRPC6 gene have been identified in eight families from different ethnic backgrounds and in three sporadic patients (8–12). As many as five of these mutations (R895C, E897K, P112Q, Q889K, M132T) were gain-of-function mutations that resulted in increased calcium current amplitudes; three of them did not modify calcium influx, even if genetic data supported their role as pathogenic variants; and the other three were evaluated by an in silico approach. In general, considering the length and the high cost of TRPC6 analysis, these mutations have been mainly detected and analyzed in adults, in particular in those presenting familial forms with an autosomal-dominant trait. In this study, we show that TRPC6 mutations can also be detected in children with early-onset and sporadic steroid-resistant nephrotic syndrome (SRNS) and describe for the first time a de novo TRPC6 mutation in a severe form of pediatric collapsing glomerulosclerosis. Thirty-three Italian patients with early-onset SRNS and three Italian families with adult-onset autosomal-dominant FSGS were enrolled (16 patients affected). Overall, all pediatric patients presented steroid resistance and early- (1 to 5 years) or late- (6 to 12 years) childhood onset of disease. Resistance to therapy was considered as the persistence of proteinuria in a nephrotic range after 2 months of prednisone treatment (2 mg/kg per day) and after 6 months of calcineurin inhibitors (cyclosporine 5 mg/kg per day). The kidney biopsy report was available and showed FSGS or minimal change disease in all index patients, except for a patient with a collapsing variant of glomerulosclerosis and another patient with IgA nephropathy with a membranoproliferative glomerulonephritis-like pattern. FSGS diagnosis was based on the histologic diagnosis of primary FSGS as defined by the Columbia FSGS classification system. As many as 2 of 33 pediatric patients were affected siblings of the same family. All patients were also screened for mutations of relevant genes involved in inherited SRNS and FSGS, such as NPHS1, NPHS2, CD2AP, ACTN4, and exons 8 to 9 of WT1. A normal control group of 170 healthy donors was also recruited and studied. All participants or their parents or guardians provided informed consent to molecular analysis. Our Institutional Review Board approved the study. Clinical details for all patients with TRCP6 variants are given in Table 1. Genomic DNA was extracted from peripheral blood samples using a Wizard Genomic DNA Purification Kit (Promega, Madison, WI). Molecular analyses of the 13 exons of the TRPC6 gene (NM_004621.4; GI 51511727) were performed by PCR, denaturing HPLC (DHPLC), and direct sequencing. TRPC6 flanking intronic primers were selected on the basis of published sequences or designed using the primer3 program (http://frodo.wi.mit.edu/cgi-bin/primer3/primer3_www.cgi). PCR reactions were run in a total volume of 25 μl with a final magnesium chloride concentration of 1.5 mM and containing 100 ng of template DNA, 1× reaction buffer, 0.2 mM of each nucleotide, 30 pmol of primers, and 0.1 U of DNA polymerase (TaqGold, Applied Biosystems). The PCR reactions were carried out for 30 to 35 cycles with denaturation at 94°C for 15 seconds, annealing at approximately 55°C to 60°C for 15 seconds, and extension at 72°C for 30 seconds. All PCR programs included an initial denaturation of 10 minutes at 94°C, and the extension lasted 7 minutes in the last cycle. DHPLC analysis was carried out on a WAVE DNA fragment analysis system (Transgenomic, Crewe, United Kingdom) equipped with a DNASep Column (Transgenomic, Crewe, United Kingdom). PCR products showing an abnormal elution profile were reamplified, purified, and sequenced using the Big Dye Terminator version 3.1 cycle sequencing kit on a 3130 Genetic Analyzer (Applied Biosystems). Sequences were analyzed by the SeqScape program (Applied Biosystems). TRPC6 novel missense mutations were checked on the DNA of 170 healthy controls by DHPLC analysis. As a second indirect demonstration, a comparative analysis in five different species (human, mouse, rat, guinea pig, and zebrafish) of TRPC6 amino acid sequences was done by ClustalW software. Moreover, the effect of the detected amino acid substitution was analyzed by two different in silico approaches: the SIFT (Sorting Intolerant From Tolerant) program (http://blocks.fhcrc.org/sift/SIFT.html) and the PolyPhen program (www.bork.embl-heidelberg.de/PolyPhen). All patients were previously analyzed for NPHS1, NPHS2, CD2AP, ACTN4, and exons 8 to 9 of WT1 mutations by PCR and direct sequencing. COQ2 and PDSS2 genes were also analyzed in the patient with a collapsing variant of glomerulosclerosis. When available, DNA samples of other family members were also obtained and analyzed. Ten highly polymorphic fluoresceinated markers belonging to the human genome were analyzed to ensure paternity and maternity in the case of de novo mutation. Expression levels of TRPC6 and nephrin proteins were evaluated by indirect immunofluorescence and confocal microscopy analysis on renal biopsies from patients with TRPC6 variants and from control subjects. Briefly, the slides were incubated overnight with the primary antibodies at room temperature (rabbit anti-TRPC6 polyclonal antibody, Sigma-Aldrich, 1:100; guinea pig anti-nephrin antibody, Progen Biotechnik, 1:100), washed in PBS, and then incubated with goat anti-rabbit IgG-Alexa Fluor 488 conjugate antibody and chicken anti-guinea pig IgG-Alexa Fluor 488 conjugate antibody (Molecular Probes, Eugene, OR), respectively. The slides, mounted with an antifading aqueous medium (Gel/Mount, Biomeda), were examined under a fluorescence microscope equipped with appropriate filters (Leica TCS SP5; Leica, Wetzlar, Germany). Confocal images were taken at 500-nm intervals through the z-axis of the section, encompassing a total of 4 μm in depth. Images from individual optical planes and multiple serial optical sections were analyzed, and the images were sequentially scanned. Image analysis was performed on all acquired fields. Negative controls were performed by replacing the primary antibody with nonimmune serum of the equivalent concentration. Each experiment was carried out 3 times. Site-directed mutagenesis experiments were carried out to insert the identified mutations into a full-length human TRPC6 cDNA plasmid (pCMV6-Vector, Myc-DDK-tagged; Origene) using the Quickchange Kit (Stratagene), according to the manufacturer's instructions, and three primer pairs containing the desired mutations and flanked unmodified sequence (forward: 5′-GAAGAATGCCACTCACTCAGCGTTAACTGTGTGGATTAC-3′ and reverse: 5′-GTAATCCACACAGTTAACGCTGAGTGAGTGGCATTCTTC-3′ for the N125S mutation; forward: 5′-GGGACACGGTTCTCCCTTGATGTGACTCCAATC-3′ and reverse: 5′-GATTGGAGTCACATCAAGGGAGAACCGTGTCCC-3′ for the H218L mutation; forward: 5′-GGACATCTCAAGTCTCCTCTATGAACTCCTTGAAG-3′ and reverse: 5′-CTTCAAGGAGTTCATAGAGGAGACTTGAGATGTCC-3′ for the R895L mutation). The presence of desired mutations in selected colonies was verified by sequencing. Human embryonic kidney 293 (HEK293) cells were successively transfected with mutant or wild-type (WT) TRPC6 cDNAs. Briefly, HEK293 cells were seeded onto 35-mm plates containing DMEM (Life Technologies) with 10% FBS (Life Technologies). When a density of 70% to 80% was achieved, cells were incubated with 3 μg of TRPC6 plasmid (mutant or WT) or 1 μg of pCMV6 empty vector (C-terminal Myc-DDK-tagged) for the transient transfection using TurboFectin Transfection Reagent (Origene). The transfection efficiency was evaluated with confocal laser scanner microscopy using an anti-DDK tag monoclonal antibody (Origene, 1:200). Transfected HEK293 cells were plated in 96-well culture plates, and 24 hours after plating cells were washed once with HEPES-buffered saline (HBS) containing 145 mM sodium chloride, 2.5 mM potassium chloride, 10 mM HEPES, 3.3 potassium dihydrogen phosphate, 10 mM d-glucose, 1.0 mM magnesium chloride, and 1.0 mM calcium chloride. Cells were then loaded with 5 μM Fluo-4 (Molecular Probes) in HBS for 30 minutes at 37°C. After washing with HBS, the fluorescence was detected with a Wallac 1420 multilabel counter (PerkinElmer). Fluo-4 fluorescence, excited at 485 nm, was detected at 535 nm. After baseline readouts for 30 seconds, cells were then stimulated with 100 μM 1-oleoyl-2-acetyl-sn-glycerol (Sigma-Aldrich). Fluorescence was collected at different time points (0, 30, 60, and 120 seconds). Calcium concentration ([Ca2+]) was obtained using the following equation: [Ca2+] = Kd × ([F − Fmin]/[Fmax − F]), where Kd is the ion dissociation constant (Kd [Ca2+] of Fluo-4 is 345 nM); Fmin, recorded after addition of 5 mM EGTA (Sigma-Aldrich), is the fluorescence intensity of the indicator in the absence of calcium; Fmax, measured after addition of 0.1% Triton X-100 (Sigma-Aldrich), is the fluorescence intensity of the calcium-saturated indicator; and F is the fluorescence intensity of measured samples (10). We analyzed 33 Italian patients with early-onset NS and three Italian families with adult-onset autosomal-dominant FSGS. Three heterozygous missense mutations (c.374A>G_p.N125S, c.653A>T_p.H218L, c.2684G>T_p.R895L) were identified in two sporadic patients and in two siblings (5-RB, 13-MS, 18-PG, 19-PR) with NS in early (n = 2) or late (n = 2) childhood (Table 1). A few additional innocuous single-nucleotide polymorphisms (SNPs; i.e., P15S [SNP: rs3802829] and A404V [SNP: rs36111323]) with an amino acid change were found in 11 patients, whereas a few others (p.N561N, p.F843F, p.T714T, and p.Q904Q) that did not result in an amino acid change were finally detected in a significant portion of our patient cohort (n = 15). The missense mutation c.374A>G was found in two siblings (18-PG and 19-PR; Table 1) with early-onset NS at the ages of 4 and 14 years, respectively. It results in an asparagine-to-serine substitution (p.N125S) within the first ankyrin repeat (ANK1) of the TRPC6 protein (Figure 1A). This substitution was previously described in a 42-year-old woman with adult-onset FSGS by Santín et al. (11). p.N125S occurs in a moderately conserved site in the multisequence alignment (Figure 1D) and in a conserved functional domain (ANK1); it is a nontolerated change affecting protein function with a score of 0.01 by the SIFT program (http://blocks.fhcrc.org/sift/SIFT.html) and is predicted to be “probably damaging” by the PolyPhen program (www.bork.embl-heidelberg.de/PolyPhen) (11). Moreover, it was not found in any of the public SNP databases or in 340 control chromosomes. Thus, according to our data and published data, this missense substitution could be classified as a high-probability pathogenic variant. Interestingly, our patients also presented a heterozygous variant (c.2491C>T_p.R831C) in the NPHS1 gene. Blood samples from parents were not available for these patients. (A through C) Electropherograms of TRPC6 mutations and (D through F) multisequence alignments by ClustalW software. The second mutation, c.653A>T, results in an histidine-to-leucine substitution (p.H218L) within the fourth ankyrin repeat (ANK4) of the TRPC6 protein (Figure 1B). This substitution, which is described in this report for the first time, occurs in a highly conserved site in the multisequence alignment (Figure 1E) and is predicted to be a tolerated change with a score of 0.16 by the SIFT program but as “probably damaging” by the PolyPhen program. p.H218L was found in an 18-year-old boy who developed SRNS at the age of 8 years. Treatment with prednisone had no effects and the renal biopsy showed FSGS with negative immunofluorescence and podocyte foot process effacement. The healthy mother was WT for the detected variant, but the father's blood sample was not available. The third mutation changes a guanine to a thymine in exon 13 (c.2684G>T), which substitutes an arginine for a leucine (p.R895L; Figure 1C). This amino acid is highly conserved through evolution (Figure 1F) and is located in the cytoplasmic domain of the TRPC6 protein. p.R895L is a nontolerated change that affects protein function with a score of 0.00 by the SIFT program and is predicted to be “probably damaging” by the PolyPhen program. It is the first de novo mutation described in the TRPC6 gene. It has been detected in a 1-year-old child with the unusual pathology feature of collapsing glomerulosclerosis with rapid progression to ESRD. Peritoneal dialysis was started at the age of 2 years. Both healthy parents resulted WT (Figure 1C) and microsatellite markers were analyzed to ensure paternity and maternity. TRPC6 is an essential component of the podocyte slit diaphragm, where it is integrated into a signaling complex that interacts with nephrin and podocin. TRPC6 is expressed in renal tubules and glomeruli, with predominance in podocytes. The expression of the above mutations was analyzed by immunofluorescence on renal tissue to determine glomerular distribution of TRPC6 and nephrin, the key component of slit diaphragm structure. In Figure 2, expression levels of TRPC6 and nephrin in the renal biopsies of two patients carrying the two new mutations here reported (Figure 2, h and i, for p.H218L and Figure 2, k and l, for p.R895L) are compared with a WT subject (Figure 2, b and c) and a patient with FSGS without TRPC6 mutation (Figure 2, e and f). Glomerular and tubular expression of TRPC6 protein was markedly upregulated in the carriers of TRPC6 changes, whereas a significant downregulation and an irregular distribution along the capillary loops was observed for nephrin protein in all patients (Figure 2, f, i, and l) with respect to the WT subject (Figure 2 c). The strong upregulation of TRPC6 in crescentic epithelial cells in the unique patient with collapsing and extracellular proliferation (Figure 2k) is noteworthy. Immunofluorescence showing expression levels of TRPC6 (b, e, h, and k) and nephrin (c, f, i, and l) on renal biopsy from (b and c) a wild-type (WT) subject; (e and f) a patient with focal segmental glomerulosclerosis (FSGS) without TRPC6 mutation; and two patients ([h and i] 5-RB and [k and l] 13-MS) with novel TRPC6 mutations (p.H218L and p.R895L, respectively). Glomerular and tubular expression of TRPC6 protein is markedly upregulated in the carriers of TRPC6 mutations (h and k) with respect to the patient with FSGS without TRPC6 mutation and the WT subject (b and e), whereas an irregular distribution along the capillary loops was observed for nephrin protein in all patients with respect to the WT subject. Panels a, d, g, and j represent negative controls. Each experiment was carried out 3 times. These findings strongly suggest that p.H218L and p.R895L could be gain-of-function variations, resulting in overly active channels, increased levels of podocyte calcium influx, and dysregulated actin cytoskeleton assembly. HEK293 cells were transfected with mutant or WT TRPC6 cDNAs. 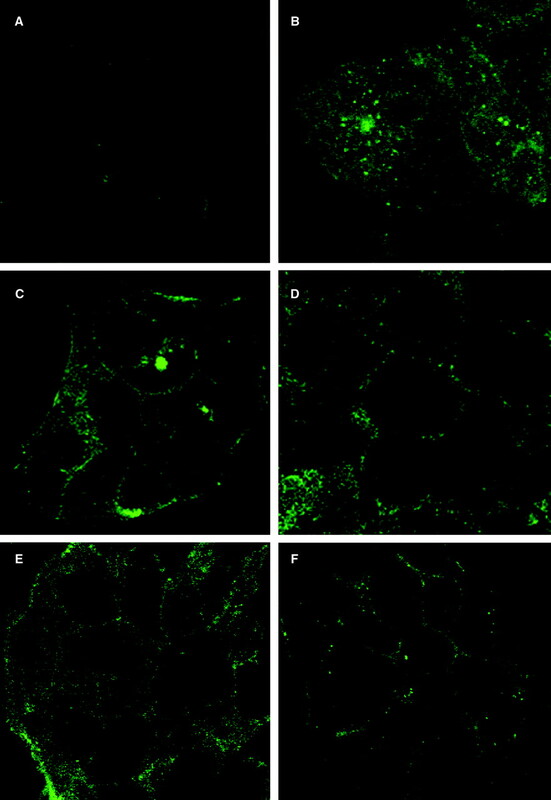 The transfection efficiency and the correct membrane expression of WT and mutant TRPC6 was evaluated by confocal microscopy and anti-DDK tag monoclonal antibody (Figure 3, C through F). Confocal laser scanner microscopy using an anti-DDK tag monoclonal antibody (Origene, 1:200) to evaluate the correct membrane expression of WT and mutant TRPC6: (A) nontransfected human embryonic kidney 293 (HEK293) cells, (B) HEK293 cells transfected with pCMV6 empty vector, (C) HEK293 cells transfected with WT TRPC6, (D) HEK293 cells transfected with N125S TRPC6, (E) HEK293 cells transfected with H218L TRPC6, and (F) HEK293 cells transfected with R895L TRPC6. To determine the effect of mutations on TRPC6 function, we measured the intracellular [Ca2+] of HEK293 cells transfected with cDNA encoding WT TRPC6 or N125S or H218L or R895L mutant TRPC6. TRPC6 is directly activated by DAG responding to PLC-mediated signals; therefore, we measured the intracellular [Ca2+] by collecting Fluo-4 fluorescence in transfected cells stimulated with 1-oleoyl-2-acetyl-sn-glycerol, an analog of DAG. As shown in Figure 4, the intracellular [Ca2+] in cells expressing mutant and WT cells was increased upon stimulation compared with the nontransfected control, but the peak intracellular [Ca2+] was significantly higher in the cells expressing N125S, H218L, and R895L mutant TRPC6 compared with cells expressing WT TRPC6 (Figure 4; peak at 90 seconds after stimulation; [Ca2+] of TRPC6N125S = 56.46 ± 13.22 nM; [Ca2+] of TRPC6H218L = 74.39 ± 8.94 nM; [Ca2+] of TRPC6R895L = 119.83 ± 2.18 nM; versus [Ca2+] of WT TRPC6 = 9.81 ± 1.96 nM; P < 0.05). Intracellular calcium concentration ([Ca2+]) measurement of HEK293 cells transfected with cDNA encoding wild type (WT) TRPC6 or N125S or H218L or R895L mutant TRPC6. Each bar represents the mean calcium ion concentration plus the SEM of three separate experiments (each with n = 6) obtained by measuring Fluo-4 fluorescence after stimulation with 1-oleoyl-2-acetyl-sn-glycerol at 30 seconds and using the equation [Ca2+] = Kd × ([F − Fmin]/[Fmax − F]). The peak intracellular [Ca2+] was significantly increased in the cells expressing N125S, H218L, and R895L mutant TRPC6 compared with cells expressing WT TRPC6 (peak at 90 seconds after stimulation, P < 0.05). Ctr, control. This is the first report describing TRPC6 mutations in a pediatric population with NS that is resistant to drugs. 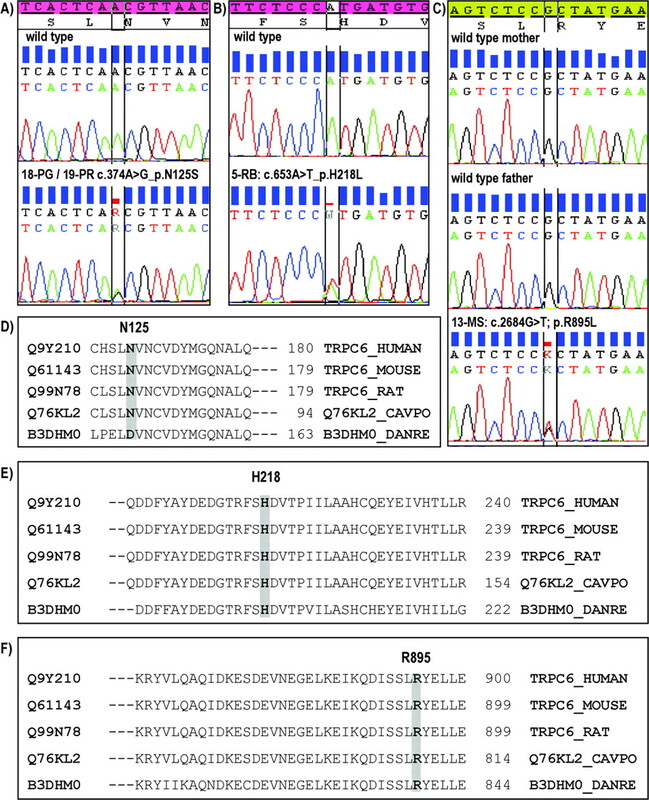 The unique description of TRPC6 mutation in a child was made by Heeringa et al. (12), who described a family in which several individuals presented the same defect. Overall, the detection of TRPC6 variants in 4 children of a small cohort of 33 children with SRNS suggests that this gene is involved, more frequently than expected, in very serious forms of NS and that it is a candidate for screening in these patients. As many as three heterozygous missense mutations (c.374A>G_p.N125S, c.653A>T_p.H218L, c.2684G>T_p.R895L) were identified in two sporadic patients and in two siblings who presented with NS in their early or late childhood (Table 1). In the kidney, TRPC6 is expressed in renal tubules and glomeruli, with predominance in podocytes. It consists of three or four amino-terminal ankyrin repeats, six putative transmembrane domains, a short sequence termed the “TRP box” (of unknown function), and potential coiled-coil structures in the amino and carboxy sequences. All detected mutations occurred at highly conserved sites in the multisequence alignment and are predicted by two different in silico approaches to be nontolerated changes that affect protein function. Two mutations here described are located in the ankyrin repeats (p.N125S, p.H218L) and one in the cytoplasmic domain (p.R895L). The same domains are affected by 10 of 11 TRCP6 mutations that have been described so far, emphasizing the key roles of these domains for the protein function. The former mutation, p.N125S, was found in two siblings who had early-onset NS (at the ages of 4 and 14 years, respectively) and presented different glomerular lesions: minimal change disease in one patient and proliferation and thickening of the glomerular basement membrane with an IgA deposition that may be defined as an atypical IgA glomerulonephritis (Table 1) in the other patient. A plausible explanation of this finding could be the genetic contribution of other susceptibility genes. In fact, even if mutations affecting other genes involved in inherited NS were excluded in our patients, the implication of other unknown molecules explaining the different kidney biopsy findings in the two siblings cannot be ruled out a priori. In any case, the clinical phenotype in both siblings was SRNS that improved with calcineurin inhibitor treatment. A constitutive activation of the calcineurin-NFAT (nuclear factor of activated T cells) pathway as a consequence of FSGS-associated mutations in TRPC6 was recently identified by Schlöndorff and colleagues (16). They showed that the activation of NFAT by TRPC6 mutants is blocked by inhibitors of calcineurin, calmodulin-dependent kinase II, and phosphatidylinositol-3-kinase (16). These data, together with our findings, suggest that calcineurin inhibitors could be further investigated in the treatment of TRPC6-associated FSGS and open up new avenues for research focusing on the calcineurin-NFAT pathway in modulating glomerular function. This may be an important clue as to pathogenesis and future treatment of these patients. It is also of note that p.N125S occurred in compound heterozygosity with a mutation (c.2491C>T_p.R831C) in the NPHS1 gene that has been associated with congenital NS of the Finnish type (17). The second mutation, which affected ANK4 (i.e., p.H218L), was found in a boy who developed a severe form of NS at the age of 8 years with complete resistance to prednisone and calcineurin inhibitors. Renal biopsy showed FSGS and podocyte foot process effacement. A further interesting aspect of the study presented here is related to the pathology picture associated with p.R895L mutation because we observed collapsing glomerulonephritis with many foci of extracapillary proliferation. This patient presented with a very early onset of NS (at 6 months) with rapid progression toward renal failure requiring dialysis. Collapsing glomerulosclerosis is rare in children (two patients have been reported so far) and has been uniquely associated with mitochondrial defects of the genes encoding for the coenzyme Q10 (CoQ10) cascade (i.e., COQ2 (18) and PDSS2 (19)). Although mutations of genes of the CoQ10 cascade are generally associated with severe neurologic symptoms and brain anomalies (nuclear magnetic resonance with bilateral symmetric areas of increased T2 and decreased T1 signal intensity in the basal ganglia (19,20)), the child described here had a pure renal phenotype. p.R895L mutation is located at the carboxy terminal in the same potential coiled-coil domain where other anomalies (p.R895C, p.E897K, and p.Q889K) producing gain-of-function changes with an increase of protein expression and calcium ion influx are reported (9,10). Several of the TRPC6 mutations that have been reported so far are gain-of-function mutations leading to increased activity of ion channels by increasing calcium current amplitudes or by delaying channel inactivation. Moreover, it was also shown that the P112Q TRPC6 mutant was more highly expressed at the cell surface, and it was speculated that the altered subcellular trafficking could explain the enhanced channel activity (8). The expression of the novel TRPC6 mutations was analyzed on renal tissue by immunofluorescence to determine glomerular distribution of TRPC6 and nephrin, the key component of slit diaphragm structure. Glomerular and tubular expression of TRPC6 protein were markedly upregulated in the carriers of TRPC6 changes (Figure 2, h and k) with respect to the patient with FSGS without TRPC6 defects and the WT subject (Figure 2, b and e). At variance, a significant downregulation and an irregular distribution along the capillary loops were observed for nephrin protein in all patients (Figure 2, f, i, and l) with respect to the WT subject (Figure 2c). Finally, to determine the effect of mutations on TRPC6 function, the intracellular [Ca2+] was measured in HEK293 cells transfected with cDNA encoding WT TRPC6 or N125S, H218L, and R895L mutant TRPC6. The intracellular [Ca2+] was significantly higher in the cells expressing all mutant TRPC6 channels compared with cells expressing WT TRPC6 (Figure 4). Therefore, most observations suggest that the high abundance of WT TRPC6 channels in podocytes contributes to a similar pathophysiology as the presence of mutated, overly active channels. A possible explanation could be that very high levels of calcium modify the cytoskeleton assembly. In fact, induction of TRPC6 expression in cultured podocytes causes a loss of actin stress fibers and proteinuria in mice, thereby suggesting that TRPC6, in podocytes, is functionally connected to the actin cytoskeleton (21). The exact pathophysiology through which dysregulated calcium influx in patients with TRPC6 mutations leads to FSGS remains unclear. The interaction of TRCP6, calcium, and actin in podocytes should be defined. In conclusion, this paper documents an important role of the TRPC6 gene in sporadic SRNS with early onset and extends the associated pathology background to collapsing glomerulosclerosis. Hyperinflux of calcium in podocytes, constitutive activation of the calcineurin-NFAT pathway, and alterations of the actin assembly are potential mechanisms for proteinuria associated with TRPC6 mutations. This work was supported in part by grants “Progetto Giovani Ricercatori” (2007) from the University of Foggia (M.G. ), “Programma per la Ricerca Sanitaria Finalizzata” (2005 to 2008) from the Minister of Health (L.G. ), and “PRIN 2009” (G.S.N.). G.C., G.M.G., F.E., and L.M. acknowledge the financial support of the E-RARE Project “PodoNet: EU Consortium for Clinical, Genetic, and Experimental Research into Hereditary Diseases of the Podocyte.” G.M.G. also acknowledges the contributions of “Fondazione la Nuova Speranza.” We thank Varraso Leonarda, Matera Rachele, Pedicillo Maria Carmela, and Trunzo Roberta for technical support. We also thank Chiara Di Giorgio (translator and medical writer, BioAgromed, University of Foggia) for linguistic revision.